Ophthalmoscope - Ophthalmic Equipment and instruments for the professional of today. The ophthalmoscope is an instrument used to examine the eye. Its use is crucial in determining the health of the retina and the vitreous humor. In patients with headaches, the finding of swollen optic discs, or papilledema, on ophthalmoscopy is a key sign, as this indicates raised intracranial pressure (ICP) which could be due to hydrocephalus, benign intracranial hypertension (aka pseudotumor cerebri) or brain tumor, amongst other conditions. Cupped optic discs are seen in glaucoma. In patients with diabetes mellitus, regular ophthalmoscopic eye examinations (once every 6 months to 1 year) is mandatory to screen for diabetic retinopathy as visual loss due to diabetes can be prevented by retinal laser treatment if retinopathy is spotted early. In arterial hypertension, hypertensive changes of the retina closely mimic those in the brain, and may predict cerebrovascular accidents (strokes). There are numerous companies other than Welch Allyn that manufacture direct and indirect BIO, including Heine and Keeler. Ophthalmo are often sold with otoscopes as a diagnostic set. 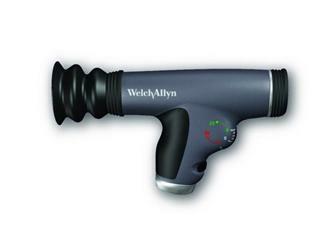 The Welch Allyn 3.5v standard head uses halogen light for true tissue color and consistent, long-lasting illumination. Versatile and reliable at an economical price. The patented Welch Allyn Coaxial Vision System facilitates ophthalmoscopy by enabling easier entry into the eye, a larger field of view and reduced glare compared to standard ophthalmoscope. The Halogen HPX lamp provides 30 percent whiter, brighter light for true tissue color and long-lasting performance. * Coaxial optics produce a shadow-free spot, easier entry into undilated pupils, and a larger field of view versus standard ophthalmoscope. * Detect corneal abrasions with cobalt blue filter. * Polarizing filter virtually eliminates corneal reflection. * Sealed optics keep out dust and dirt. * 18 unique aperture/filter combinations for greater versatility. * Red-free filter may be used with any aperture. * 28 focusing lenses with a range of -25 to +40 diopters. The Welch Allyn 3.5V AutoStep coaxial head utilizes patented coaxial optics, Halogen HPX illumination and 68 focusing lenses combine for premium quality. The Halogen HPX lamp provides 30% brighter, whiter light output for true tissue color and consistent, long-lasting illumination. If you need more information fill the form and specify the model in the Comments Field.